Product prices and availability are accurate as of 2019-04-18 07:16:04 UTC and are subject to change. Any price and availability information displayed on http://www.amazon.com/ at the time of purchase will apply to the purchase of this product. 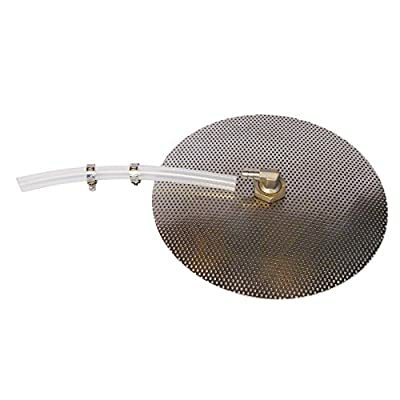 It is a 12" domed false bottom with 3/8" barb. For insulated 10 gallon round beverage containers, like Igloo or Rubbermaid coolers, or any container with at least a 12" opening at the top. Made from stainless steel with 3/32 perforated holes on 5/32 centers. The barb fitting is 3/8", 12" round, heavy duty 18 Gauge stainless steel, 3/32 holes on 5/32 centers, 3/8" stainless steel barb fitting Included, 7/8" hole in the center will fit any 1/2" threaded fitting, includes 12" of 3/8" high-temp silicone tubing. 12" Round Heavy duty 18 Gauge Stainless steel 3/32 holes on 5/32 centers 3/8" SS barb fitting Included 7/8" hole in the center will fit any 1/2"